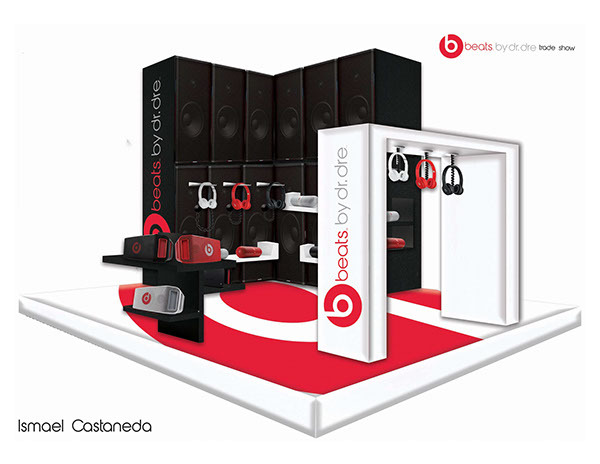 A innovative design for a trade show booth for Beats by Dr. Dre. The trade show to composed of 3 different unique fixtures. The first is a 7 foot standing fixture that allows shoppers to go underneath the fixture and pull down the beats headphones for a 360 experience. The second is simple set up with a asymmetrical fixture that displays the classic Beat Box. The focal point and final fixture is the speaker wall. It is composed of beats speakers used for an auto purpose, it projects shelving for the beats pill and metal fixture arms for beats headphones to hang off of. On the sides are compartments for extra inventory. This was created using Adobe Illustrator to create a perspective template and Adobe Photoshop to fill in the template with realistic textures and products.